How far do you drive every day? How long are you in your car? For a lot of people, they can be in their car for almost an hour during their daily commute, with a report in 2011 found that the average Australians spends 53 mins travelling every working day . With all the time spent in the car, you probably don’t realise just how much driving alone could be costing you. In 2016, the Australian Bureau of Statistics found that an average passenger vehicle travelled 12,800 km’s per year and that the average fuel consumption was 10.6 l/100km. This means that on average 1,356.8 litres of fuel is being consumed each year per vehicle. With an average fuel price of $1.25 per litre, it means the average car owner will pay about $1,700 per year on fuel. But with fuel prices ever increasing, this number is sure to go up . Fuel is already a huge cost, as prices continue to soar it becomes a larger and larger expense each week. 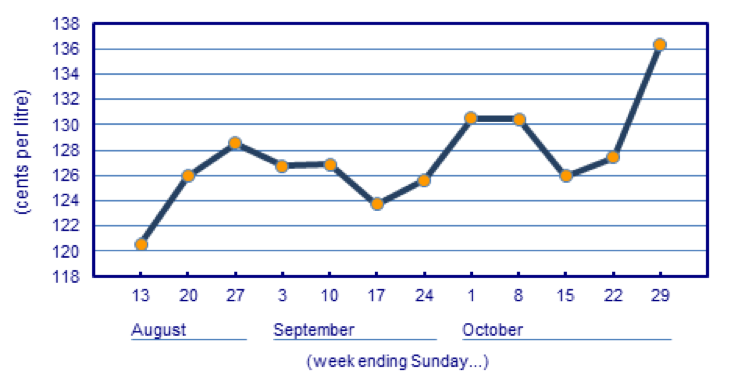 The graph below from the AIP shows the national average fuel price over a 12-week period and you’ll notice despite fluctuating slightly, there is a noticeable upward trend . For a 10km commute over 240 days (a typical working year) the petrol cost is $636 annually just on the way to and from work. 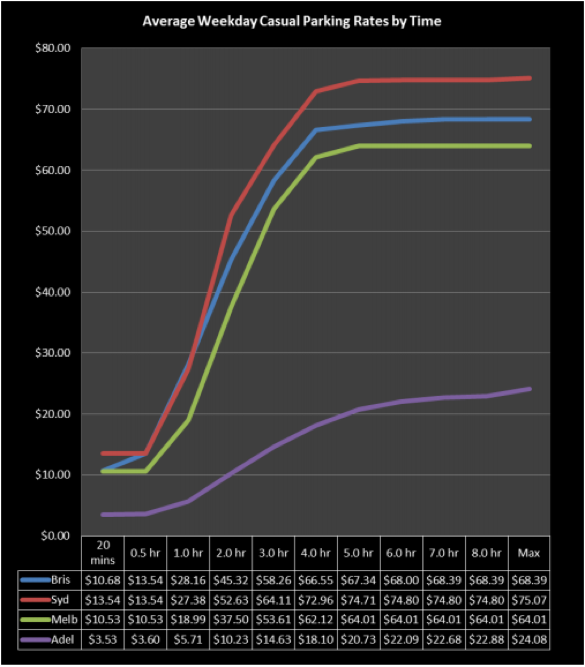 Parking prices around Australia are also increasing consistently over time. Parking hourly can be incredibly expensive with prices reaching over $60 for one day in most capital cities in Australia . There are options in many places to book parking bays prior to arriving, however this can still cost over $15 a day. That equates to $75 dollars for a 5-day working week and $3,600 for a 48-week working year. Owning a car comes with many additional expenses each year. At the cheapest places, servicing a car can cost anywhere around $150 and most mechanics recommend you get your car services twice a year (this is not counting replacing parts like tyres and batteries, though they do also add up). 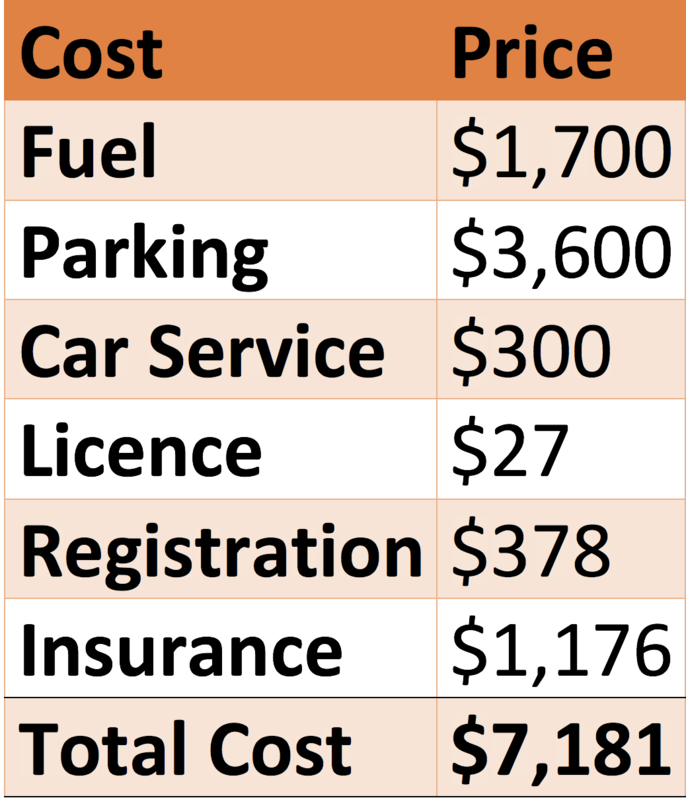 A driver’s licence costs $27 a year in WA, and according to the RACQ the average price of registration across Australia is $378. . Insurance ranges anywhere from $570 to $2,610 per year depending on your demographic, according to Canstar it costs around $1,176 on average . Considering these different factors, you can easily spend over $7,100 annually on your car. You obviously can’t save on registration or insurance, but you can save on fuel and parking. An average driver spending around $5,300 annually according to our calculations. Using Kapuddle you could recover almost 50% of the costs you pay annually on your car. If you car-pool with Kapuddle and you drive 10Kms and pick up 2 passengers going to and from work, you could recover $280 per month in running costs ($3,360 per year). The saving can be immense, the trip is more enjoyable and there is even a great environmental benefit. 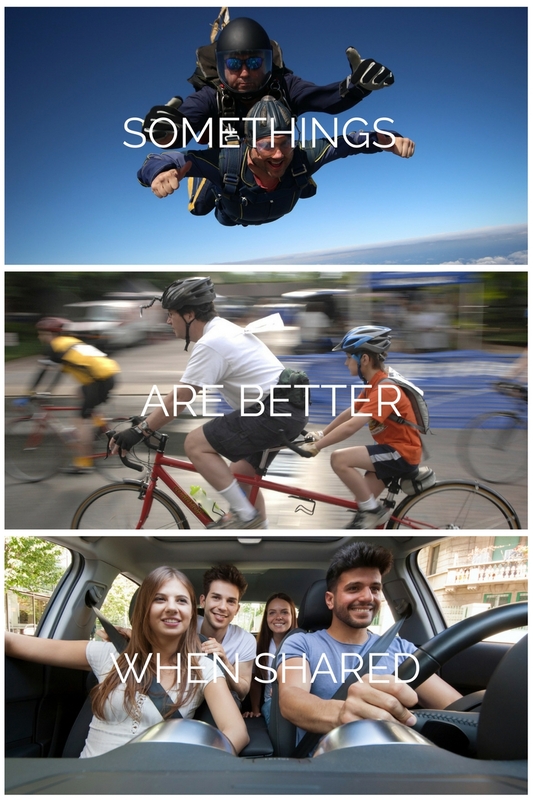 Driving with Kapuddle is a great way to save money while you drive to work, university or anywhere you need to go.